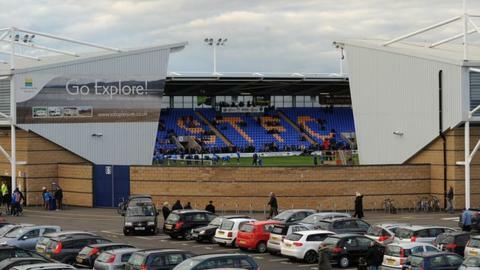 Shrewsbury Town have appointed Blackpool secretary Matt Williams as the relegated club's new chief executive at the Greenhous Meadow. Williams, who ran Blackpool's media and commercial departments, was at the club for more than 12 years. Town manager Mike Jackson worked with Williams when he played at Blackpool for two seasons, prior to joining Shrewsbury, first as a player, in 2008. Jackson is keen to stop on following Town's relegation back to League Two. Jackson's number two Andy Morrell was also on the Blackpool playing staff in Jackson's time at Bloomfield Road. "I know from my recent discussions with the chairman that the entire club is hurting following relegation from League One," said Williams. "We have some significant work and big decisions to make in the coming weeks. "The club needs to move forward again both on and off the pitch. "It is clear that there is real potential and opportunity at Shrewsbury to grow and succeed - I am fully committed to making that happen. "It is a great honour and a privilege to be involved in the management of such a fantastic club. I am looking forward to the challenge and I cannot wait to get started." Blackpool, who were in the Premier League just three years ago and were beaten in the Championship play-off final in 2012, just escaped relegation from the Championship this season.